Make sure you have your replacement cartridges handy before you begin. You must install new cartridges immediately after removing the old ones. 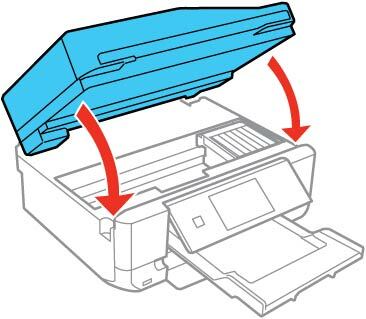 Leave your old cartridges in the printer until you are ready to replace them to prevent the print head nozzles from drying out. Do not open ink cartridge packages until you are ready to install the ink. Cartridges are vacuum packed to maintain reliability. 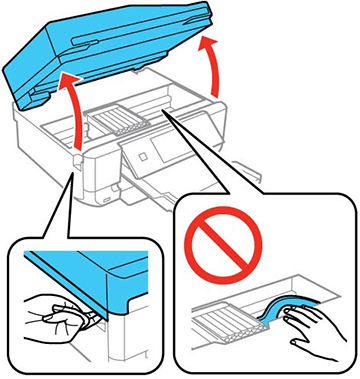 Make sure that the CD/DVD tray is not inserted for printing. If an ink cartridge is expended, you see a message on the LCD screen. Note which cartridges need to be replaced and select Proceed, then choose Yes, replace now. If you are replacing a cartridge before you see a message on the LCD screen, select Setup > Maintenance > Ink Cartridge Replacement . Press the start button. Lift up the scanner unit. Do not move the print head by hand; otherwise, you may damage your product. Do not touch the flat white cable inside the printer. Push in the blue tab to unlock the ink cartridge you are replacing. Then lift the bottom of the ink cartridge to remove it. Warning: If ink gets on your skin, wash it thoroughly with soap and water. If ink gets into your eyes, flush them immediately with water. If ink gets into your mouth, spit it out and see a doctor right away. Keep ink cartridges out of the reach of children. Recap the used ink cartridge using the cap that came with it. Note: Dispose of used cartridges carefully. Do not take the used cartridge apart or try to refill it. 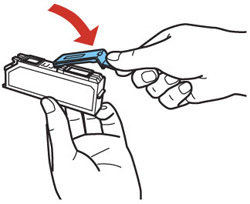 If you are replacing the Black (BK) ink cartridge, shake the new cartridge gently four or five times before unwrapping it. You do not need to shake the Photo Black (PBK) cartridge or any of the other color ink cartridges. Do not shake the cartridges after opening the packages, or ink may leak. 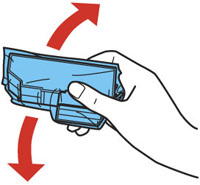 Remove the cartridge from the package. Do not touch the areas shown above. Doing so may prevent normal operation and printing. Remove the cap from the cartridge and store it for later use. Note: Save the cap so you can recap ink cartridges before storing or disposing of them. Do not remove any other labels or seals, or ink will leak. Insert the ink cartridge head first into the ink cartridge holder. Then press the bottom of the ink cartridge down until it clicks into place. Once you replace all the cartridges that need replacing, close the scanner unit. The product starts priming the ink. This takes a few minutes. When you see a completion message on the LCD screen, ink replacement is complete. Note: If you see an error screen telling you an ink cartridge is installed incorrectly, lift up the scanner unit and press the ink cartridge down until it clicks into place. When you're finished, close the scanner unit. If you remove an ink cartridge for later use, recap the ink cartridge using the cap that came with it to prevent the ink from drying out and to protect the surrounding area from getting smeared by ink. Store the ink cartridge in the same environment as the product. 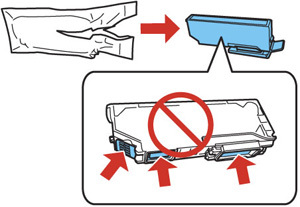 Do not leave the product with the ink cartridges removed for an extended period of time. Otherwise, ink remaining in the print head nozzles may dry out and you may not be able to print.